With all the snowstorms and odd weather of late, I could use some warming up. And no better way for me to do that than to think of myself sitting on the beach at sunset and taking in the scenery. Here's a few archive photos from Anna Maria this past January. Two gulls were fighting over a dead fish that had washed up. Notice the guy on the right sneaking up while the other one is busy? I think the two were in cahoots to steal the fish! I find myself oftentimes wondering what birds think. Like the guy above, just standing there. Is he hungry, tired, lonely, bored, happy or sad? I imagine their thoughts are nothing quite that complex. love the 'attitudinous' terns. 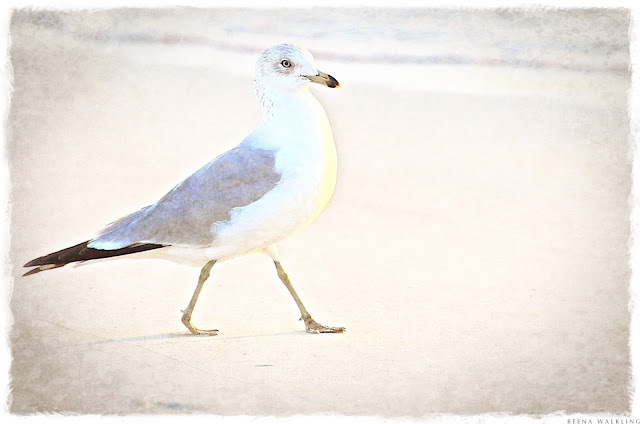 :) and the strutting gull in the first. Beautiful pictures. I think the birds are thinking the same thing we are - Spring! Hopefully it is here soon. It would be nice to wade in that water. I waded in 10 inches of snow today sledding and shooting some birds feeding at the fedders. A beautiful series. I love the painterly processing. It does pay to be a bird brain on occasion. 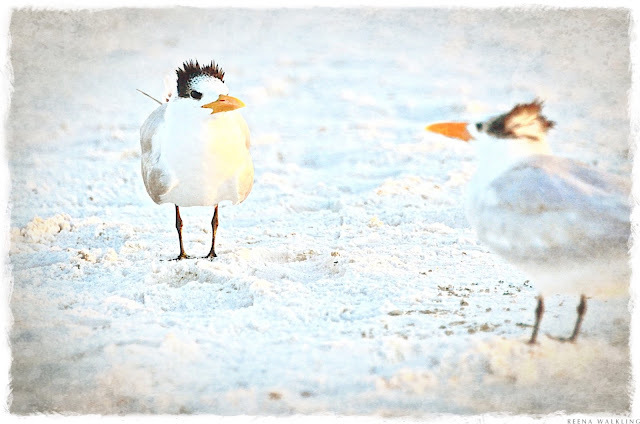 ;) Love those royal terns.. nifty birds. What do birds think? a question to ponder. I know what they think when they're sitting in my apple tree .... lets eat as much as we can before Mamma comes rushing out the back door screaming and flapping her tea-towel in the air. 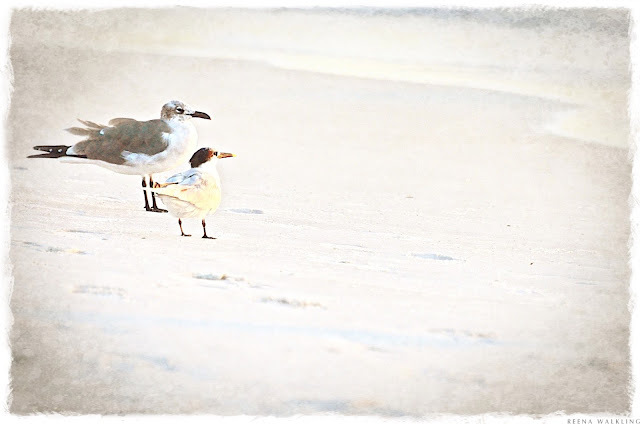 Maybe shore birds are different .... there minds wander to fish and worms and long flights over blue seas and scamperings over rocks with beach views. 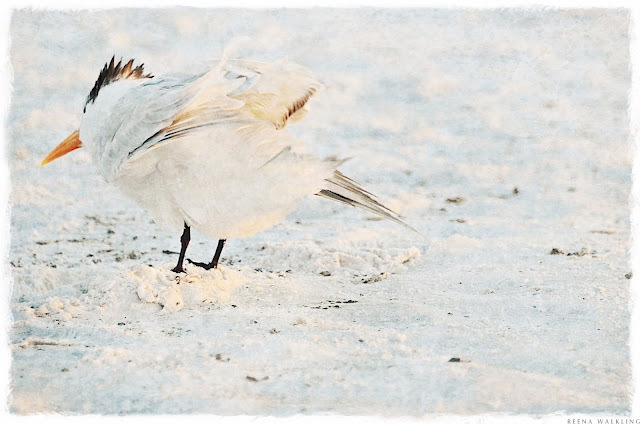 The Terns are one of my favorite birds to see at the beach. They have attitude! Great post and photos, have a wonderful weekend! Great pictures! Like you I could use some serious warming up in my parts! At least you've given me this great visual of warmer weather to come! Yes, I'll join EG and you in your lovely daydream! I do love your photos and thoughts and that spiky feathered one is the best laugh of the day! Thank you!! Have a lovely weekend, Reena! The beach does sound good right now. It's pretty cold here in Ohio. This series of photos take on the quality of beautiful watercolors. I really like how you've composed the photos. I'm always ready for a trip to the coast so thanks for taking us back with you. Love the processing of these! So I am too, a tree, an ant, a birds, a bug etc. Though I am still myself. Beautiful Gulls. Good thinking Reena. Beautiful photographs, Reena, especially the first one. He looks like he's really "struttin' his stuff!" Such gorgeous shots - just lovely! Waterfowl seem to spend a lot of time just sitting...maybe thinking? Definitely in their own world(s). I don't know what those birdies are thinking but I sure would like to be on that beach with them! Wow...that's bad when you type/spell your name wrong... LOL! I like watching gulls, but most of them have the morals of politicians on crack. They all seem to consider anything fair game, no matter who the rightful owner may be. They look like watercoor paintings! Your photos are wonderful. Makes me wish I was back at the beach. I could just sit and watch the Gulls all day. 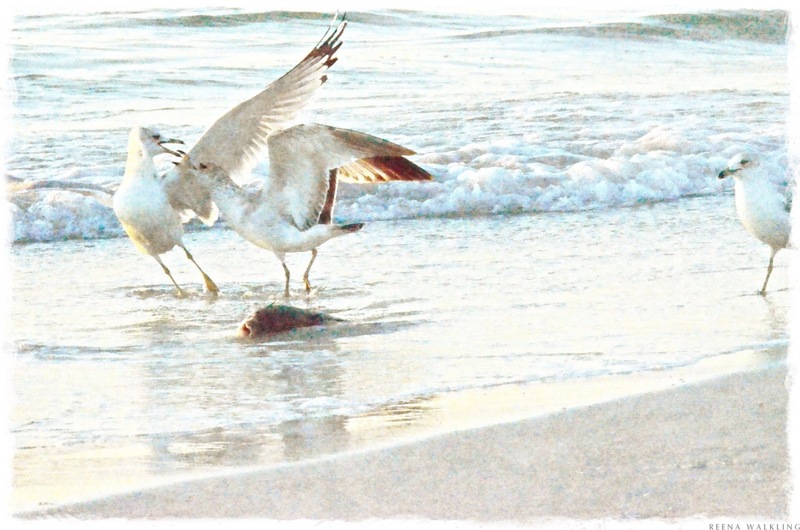 great series of bird photos, reena. Such beautiful photos ~ I love the pale colours and the rough edge borders! Great shots! I love the regale spike. Those Royal Terns always make me smile - something about their crazy little feather hair! What great birds!! Especially love your processing!